potentially nervous: bunny contemplating King Midas as we bite the bullet and sell out. bunny contemplating King Midas as we bite the bullet and sell out. here we go folks...slowly adding some adspace. feeling potentiallynervous about it, but we just can't afford our 'lofty' aesthetic. if i see one bunny cage advertisement pop up i'm shutting the whole thing down. hopping for cruelty free L'Occitane lip gloss, animal communicators or reputable rabbit acupuncturists. Yes. Everything that Nuage touches will now turn to gold, metaphorically speaking. But why so down on cages? My rabbits love their cage. I leave it it open and they hop in and out of it and they like to sit on top of it on a towel. It is their refuge--the place where they store all their valuable poops. Ah, the glow of an East Coast sunrise, I presume. I have no rabbitwares to flog via your site, or I'd be advertising here myself. But I'm always up for building a custom multi-tiered bunny castle complete with turrets, moat and drawbridge if someone wants to order one! They'd have to be Albertan, though - shipping on a 150 lb structure would be a killer. ahhh lisee....you didn't know i was anti cage? well i'm anti cage. i think that's great if you leave the cage door open and don't lock it and the bunnies can come and go as they please, but so many people don't use a cage that way. i'm totally into forts and having all sorts of hiding places and retreats for the bunnies to tuck themselves into, i've just never used a cage for that. bells and nuage had a cage in their room for awhile, (i only had that cage because fats and nuage came in a cage from their previous owner who were giving them up), but they never went inside it unless they knew it was toenail clipping time and then it was too hard to get them out. so i'm always constructing new little cubbies for them to explore and bunny proofing my house. they are all litter box trained. if a cage company came out with removable doors and promoted them as such i'd consider it but i think too may people keep their bunnies in cages and most all bunny supplies are designed for caged living and i've always been on a personal crusade against that. we're all about the free range cageless bunny here at PN, i'm surprised you haven't noticed that given my images. and mr. malcolm if you think there's a chance in hello of me seeing a sunrise on any coast than i've got a great little bridge for you!...the light is gorgeous here at the cabin but that yellow glow is all iphoto, shot possibly around noon EST. actually i'd like to take that back about the removable doors....i don't even think i'd advertise for them if their doors were removable....cages make me really sad, it's just the way i'm wired i suppose. you know the first thing a vet usually says when they touch my bunnies is that they are amazed how supple they are. their muscle tone always sort of surprises most vets. i never knew what to make of that until i started doing some bunny consulting for people and noticed how hard and rigid most bunnies were. the only thing i could think of is that their muscles slowly atrophy over time from not getting enough exercise. my bunnies are especially active at night and i know a lot of people have their bunnies out during the day but when they go to bed thy put their bunnies in the cage. here, it isn't until about midnight that mine run around like lunatics and continue to do so until about 5am...so if that's the natural cycle for bunnyrunarounds, that is most often the time when they are locked up. and then they sleep all day even if it's in a 2000 sq ft room. I had noticed that yours are free range. And nothing tickles me more than when that picture of fluffy Fats hopping down the muddy country road comes up on my new screensaver. And I have seen some of your previous comments about cages. But right now one of my rabbits is stretched out in their cage and the other one has comandeered my only arm chair. I got my rabbits as rescues from a bust of an illegal poultry market. And one of them actually wouldn't come out of the cage for the first month I had him. He really couldn't get his mind around the idea at first until I took apart the cage and slid him out of it. But now they both show off hopping into the cage from the side and then out the top of the cage and onto their towel on top as quick as-- well as quick as bunnies! lisee it's the in AND out that's the trick....as long as they get to go in and out at will i'm sure they are very happy! i hope you realize that i'm trying to address the bunnies who don't have options. Sadly i have to have them separate at times as kitty really doesn't get along with anyone other than Zack, but i do "shifts" where they all get about a half a day or so before swapping. Last time she got out there was an emergency vet trip, she got bit on the face badly. :( Thankfully i have my ground floor bunn-proofed, so i can leave two out that get along while i sleep and not worry. Sometimes i wake up and they are at my bedroom door, that's a sweet feeling. It is a great feeling when the vet says that they can't believe how in shape your bunnies are, i get that and it makes me happy. Most bunnies and cages are horrible though, i've heard horror stories, and one of my previous one came from a home where he had his nails so long they got caught on the wire bottoms of cages (none of mine have those, i hate those wire ones, worry that it hurts to stand on). Almost all my bunnies have come from the humane society who caught them outside after people just let them go. After that, i think i should spoil them as much as i can, they deserve it. I would serve King Nuage happily. Yay for cage free! My first rabbits were kept in cages since I was younger and my parents were "In charge" of my bunnies. But now I don't have to follow rules so I'm cage free. We do have a giant pen for when I need him in a specific area for a bit, but it's used more to block off my movie and book cases from evil bunny teeth. Not sure what the protocol for a cross blog conversation is but I thought I would answer your comment in my blog here :) -- you asked" i'm curios if my blog was somewhere on that trail? " -- one of my virtues is pure inquiry so I'd like to think you would have shown up somewhere along the line but I actually found you in someone's "blog I am following" list. I'd love to tell you who but because of the big One World One Heart blog hop I'm a part of I've been to about 200 blogs in the past week... Potentially Nervous called to me and then when I got here your tag line "the world is going to hell, here are some bunny pictures" (did I remember it right?) just totally cracked me up! I also love the cage free living your bunnies enjoy! I look forward to stopping by regularly! P.S. Blogger was being weird yesterday... I think my follow button is back on top of the blog and in my lefthand column... please feel invited anytime! Lisee, I'm in the same situation as you. Nibbsy came with a cage, and for the first week he lived with me he was really scared to leave it. But the door was always open (literally and figuratively). Gradually as he got used to me and the new space he started venturing out, and nowadays the cage is just the litter box location, which means it's sometimes but not always the nap location as well (he gets pooped when he poops). I have considered ditching the cage entirely, since I really don't like what it represents, but right now it serves as a neat little cave and nothing more. I laughed when I read your description cause it's exactly the same as mine, even down to the towel on top. Well, Nibbler doesn't store *all* his valuable poops in there--unless he has a couple worthless ones every day that he just has to get rid of? i was just having an email discussion with a friend and i was remembering my vintage couch that got destroyed by my bunnies, not from chewing but bells is a notorious bed wetter or anything soft and cozy like a bed...my solution is that i don't have a squishy couch anymore. but if i did i'd put an ex pen around IT...so how's about that for an idea...cage your furniture, not your bunny? wouldn't you rather your bunny be happy and healthy than your inanimate objects? bunnies are clever but hopefully you are even more clever...you can do it! i think that so many people keep their bunnies in cages that no one even thinks not to...but let's think about it and then let's see what happens. worthless poops? is there such a thing...when i'm cleaning up the stray poops they look at me like you better be framing those or dipping them in gold for preservation purposes. Please email me when you get a chance. Your bunnies are beautiful. Razzy and Sugie live cage free. They are free to roam around Bunnyville 320 square feet as they please. They do tend to remain in certain areas and the bunny magic dream cottage is a favorite. However, if they needed to be confined to a certain area because of kiddo's or other critters, I would keep them in a playpen area (no top and lots of room) and never in a confining cage with a wire bottom like a lab animal awaiting torture. Life is meant to be enjoyed and lived free by all. Humans and critters alike. It's a beautiful world we all share and I believe in taking care of my tiny part of this beautiful gift that was given to me. I wouldn't give it another thought, go for it! If you're using Adsense you'll get all kinds of junk. I would remove the reference to c-a-g-e-s, that's bound to bring up exactly what you don't want there. In fact, you might want to post about what you want to see. It's tricky. Oh my I didn't think about that Paula. So no more talk from me about C-a-g-e-s.
My rabbits poop diamonds. my rabbits drive american cars. My rabbits drink fine bourbons and beers and tequila. My rabbits like their martinis shaken not stirred. My rabbits chew tobacco. My rabbits smoke cigars. My rabbits love Apples,the Macs and the ipods. My rabbits invented hip hop--mostly hop. My rabbits contribute to worthy causes. My rabbits vote Democratic. My rabbits should be named blu-ray and Hi-Def . My rabbits use blackberries and IPhones. They text with their noses. My rabbits love them some timothy hay and pellets. My rabbits are vegetarians. My rabbits eat magazines, lots of magazines. My rabbits still read newspapers. My rabbits have beautiful teeth and would look good on a tooth paste tubes. My rabbits shred lingerie. My rabbits enjoy luxury cruises. My rabbits fly JetBlue. My rabbits use nothing but the finest Canon photographic equipment. 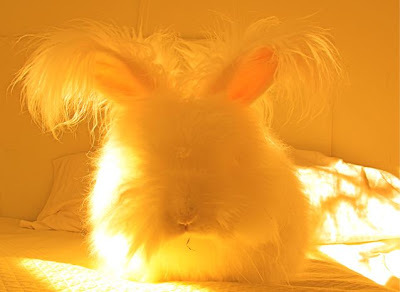 My rabbits are Golden but not so Golden as New Age. No-not by half. Can I get an 8 x 10 of this one?